Killed by Morgan’s outlaw militia during their attack on Epulu of 24 June 2012. Surprised at about 5AM, he defended the Okapi Reserve’s station and managed to kill one of the outlaws before being shot dead himself. Morgan’s men cut out his thigh and then burned his body. Fiston became a guard in 2010 after a three-month paramilitary training. Octave was patrolling a second night at the station barrier when the militia attacked Epulu very early on the 24th of June 2012. A militant shot him at point-blank range and he died next to the small immigration office, he was buried with his colleagues two days after the attack during and after Morgan’s band returned to the forest. Disciplined and calm on patrols, he was given the nickname of ‘father’ or ‘mupe’, he was head of the Patrol post at Mamopi where he maintained a rigorous professional attitude towards those who tried to bribe him in order to exploit gold in the local mine. On the 24th of June, he was identified as a guard although unarmed and burned alive publicly in the center of Epulu. His charred remains were buried two days later. On the 24th of June he defended the Station and tried to cover Fiston but was shot in the stomach. He was finally hospitalized for four weeks in Mambasa where he told his colleagues, “Morgan destroyed our belongings but not our spirit”. He has now returned to Epulu and after healing will rejoin the defenders of the Reserve. Killed during the month of November 2012 when Stany was part of a mixed ICCN/FARDC team that was tracking Morgan and his team. Stany took the position of advance unit when he fell under the fire of Morgan’s band. During the attack on Epulu Stany’s wife was raped and carried off. To this day she has not been liberated. Kamango was killed by Morgan’s outlaws as they advanced towards Mambasa in January 2013. He was travelling in a vehicle to his patrol post he was in charge of at Adusa. He was pulled from the truck and recognized as a park guard , tortured throughout a day before finally being killed. The bandits eviscerated him, ate the heart and the liver and threw the rest of his body on the side of the road. His family recovered the body a day later. Wounded when ambushed by Morgan’s bandit band while tracking them in the forest as part of a mixed team of park guards and military. A bullet passed through his body close to his neck. He passed several days without eating and received first care in the forest before making it back to Epulu and finally to the hospital in Mambasa. Colonel Yav was responsible for the interventions and diplomacy that led to a stabilization plan for the central sector of PNVi (fin 2010) as well as the evacuation of about 800 military and their families. In the south part of Lake Edouard his efforts brought the illegal fishing under control and led to effective protection of elephants and hippopotami. He oversaw the collaborative operations of FARDC and ICCN that succeeded in weakening illegal armed groups (FDLR, Maimai, poachers…) and secured the road traffic. The stabilization and the repopulating of the fauna in the central sector of PNVi is in large part the fruits of Conservateur Rodrigue and his men. He took charge of the sector in 2010 and since then has shown devotion and incredible bravery at the most difficult moments. He led successful operations against all the active forms of illegality: illegal fishing, poaching, cutting paths… His sector has the greatest concentration of armed groups of all PNVi and he has barely escaped several ambushes. Serving ICCN since 1995, he was killed at Kanyangwanzi (central sector) on the 9th of May 2012 when his team was bringing help to civilians who were held-up and robbed in a mini-bus on the national route that traverses PNVi Sud. They fell into an ambush set up by the armed group at the beginning of the M23 movement. Paluku worked with the elite teams, notably the Advance Guard. From 1990 until 2011 Chief Elenge was a steadfast opponent to PNKB despite numerous contacts and outreach seminars. It was in 2011, invited to take part in two sessions of explanation and evaluation for the management plan of the park that he declared independently that it was time to stop blocking the park. Henceforward, he has undertaken outreach amongst his own population. He coordinates the commission for the participative delimitation of the Park. His population, previously hostile, is now working in close collaboration with park staff. Currently he is bringing his “neighbor”, also a chief in opposition to dialogue with the park so that delimitation can continue to advance. The Upemba station was attacked during the months of July and September 2012 by outlaws calling themselves, “Maimai”. On the 16th of December the Site Chief, Atamato, left for the town of Lusinga to use email in order to inform his hierarchy of the current situation. On his return, he was caught in a Maimai ambush and shot down. He died on site, in uniform. Testimonials have been sent by colleagues who remember his courage and dedication ever since he became ICCN in Garamba in 1989. Already in 1994, caught in an ambush, he saved his chief who was wounded and galvanized the troops to push the SPLA into retreat. In 1998 he contained an upsurge in poaching and received a bullet in his calf. Moved to PNVi nord, he was put in charge of the Mutsora station, which he took in hand by courageously facing the complex security situation of the region. He was promoted and sent to Upemba where he became a key figure in the management and plans of UNP. “It is one of the great fighters for conservation who has left us”. Victor and David were both secondary school teachers and started working at Ekoko ya Bonobo in 2009. Victor was appreciated for his courage and punctuality at work, joining the bonobos before their morning awakening, David was known as an indefatigable guide. As guides, both carried out daily follows of the bonobos in their natural environment in order to follow the process of re-adaption after being brought and released from their previous home at Lolo ya Bonobo. These two men also regularly participated in anti-poaching patrols and outreach to local people by following the navigable rivers that define the limits of the reserve. After two years of daily follows without interaction with the bonobo, the two were attacked by the bonobos during a follow in August 2011 and seriously wounded. Both had parts of the faces ripped off as well as fingers. Their association has taken charge of their rehabilitation including time in France where they will go for further plastic surgery next year. Both are determined to continue to work for nature conservation in Congo. Stalwart though faced with relentless pressure coming form certain state services in Mankoto and in Boende, he continued to insist on the incineration of an entire large load of bushmeat he confiscated during the month of August 2012. He brought his hierarchic chiefs (ICCN and Secteur) to adopt his logic and to have a public burning and thus to show the importance of rule of law in PNS. The bushmeat was about 1000 KGs and included some totally protected species. According to the witness of the population it is the first time such an operation has happened in PNS since its creation. Boni is a dynamic and dedicated monitor of bonobos and illegal hunting. After an increase in armed hunting in the park, his patrols succeeded in 2012 to arrest six poachers and two 12 calibre shotguns. In October Boni led a team of three to inventory bonobo nests. There was no guard with them and they were unarmed. Having found a hunting camp they burned the bushmeat, but the poachers heard them and laid an ambush. The hunter fired on the approaching monitors but missed. Boni leapt on the hunter. Another poacher came from behind with a knife and slashed at Boni, stabbing him twice in the hand. Boni did not let go until another of his team could help him. He lost a lot of blood. When finally he was strong enough to go to Kindu to see a doctor, a bushmeat lobby managed to have him thrown in jail. Liberated, he continues monitoring. Mwami Saambili is one of the rare traditional chiefs that support the clarification of the borders of the park. He actually spent more than 30 days in the field with ICCN teams for a participative delimitation of the park borders in the Semuliki forest (Watalinga). It took remarkable courage as a chief to work in an area of such insecurity where he would likely be targeted. His contribution was invaluable in convincing villagers of what is written in the original texts creating the park and the need to accept a park in their midst. The Chief of Command, Augustin, and two patrollers G1, Vincent and Patrice were killed when their patrol vehicle was attacked by rocket at 6 in the morning and burned. They were being deployed along the central road in the Park in order to protect travelers traversing the zone. The probable assailants, never apprehended, were FDLR. Five military were also killed and they were all buried together at Mai ya Moto. A patrol vehicle came upon a group of the FDLR militia looting a public transport bus transiting through the park. The patrol’s driver, a young guard named Mastaki, was seriously injured with bullets through eye, arm and chest. He died several days later in hospital. The guard, Muhindo was killed instantly with two bullets to the chest. The ICCN vehicle was ambushed when returning from operations in the Rwindi sector of the park. Three other rangers and the driver were injured and found during the search between 9 PM and 1 AM. Katchupa bled to death during the night. In an ICCN speedboat Mayani and a small group of guards pursued an illegal boat in the park on Lake Edward. Mai-mai in the boat opened fire, wounding Mayani. The patrol operation continued. Arrests of three Mai-mai were made and the boat seized. Mayani later died in hospital. A group of guards that were carrying out a patrol on foot were caught in an ambush of uniformed FDLR militia. The patrol was in the forest north of Nyiragongo volcano where illegal charcoal production within the park was increasing. For fear of FDLR attacks, tourist visits to the volcanoes had been halted for a week. Magayane, who was shot through his pelvis and died soon after he was carried out, was buried in his home village of Jomba. As a hereditary “elder”, Ramazani was the only leader to brave the vocal and threatening bushmeat lobbies organized by buyers and sellers from the provincial capital of Kindu at the traditional ceremony of Kakungu in 2010. Ramazani supplicated the Territory Administrator to protect the forest. He led other elders and chiefs in a subsequent Tambiko ceremony at Olangate village where chiefs and elders supported a National Park in their territory. He essentially silenced the bushmeat lobbies – at least for the time being. During early 2011 Major Guy played a key role in establishing security in two of DRCongo’s major conservation landscapes TL2 and Bili-Uere. In Bili-Uere Major Guy accompanied the Chef de Bureau ICCN to reestablish ICCN authority in the area. He held a disciplinary meeting with FARDC troops in Buta making clear that their banditry and poaching would no longer be tolerated. In TL2 he arrested 5 Mai-Mai poachers and thieves; he also had meetings with an evangelist-outlaw stating very clearly that person’s inability to establish his own law. Major Guy’s restraint with arms and firm insistence on lawful order won him respect everywhere. In the far north of Orientale Province, in the chiefdom of the Gowa, village of Ndamala, rogue soldiers of the armed forces of DRCongo not only hunted as they wanted but undertook massive elephant poaching in the Bili Uere Reserve. When Chief Kpilimbalo not only refused to cooperate with them, but also reported them officially to his Territory, he was threatened with death by the military. He fled, leading his entire village to safety in the forest. James joined ICCN in Epulu after paramilitary training in 2002. 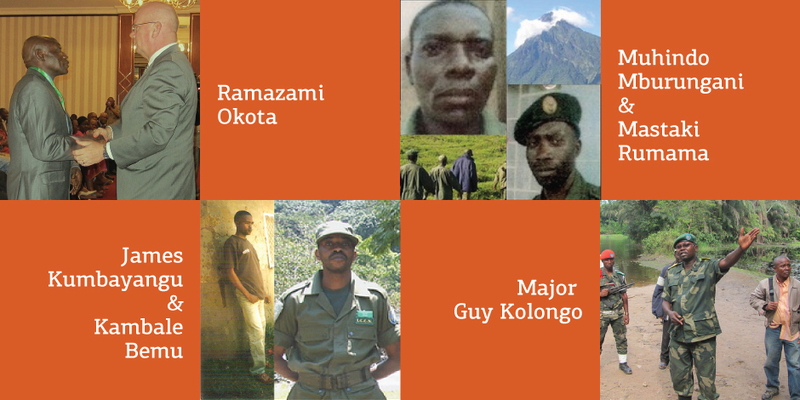 He continued para military training and was named instructor at the Ishango training (Virunga) in 2005 because of his high achievement. His bravery and clever strategizing caused him to rise in rank becoming the associate commanding chief of the guard force in the RFO. On this occasion 23 December 2010, his mixed team of guards and military encountered a group of 48 poachers with lookouts hidden in the forest. James team captured one, but as James spoke with him, another, still hidden, fired on James from behind. Struck in the hip he continued to encourage and guide his guards until he died. This included not only instructing one of his team on how to fire a rocket propelled grenade, but also use of his own arm. He died an hour later. Known as Didi, he joined ICCN in 2008. He was appreciated as brave and responsive in guard patrols. He was particularly recognized by his superiors for his refusal to take bribes when posted at potential mining sites. In the same confrontation that cost James his life he forged forward and took two bullets while recovering an arm. The injury cost his life 2 days later, before he managed to reach the road. In the battle the ICCN managed to recuperate two military arms and to kill 8 poachers at the site. The identity of the uncontrolled military that were among the poachers has not been made public, nor are any in custody. Agare started working for ICCN in Garamba National Park in 1996. Because of his bravery and good sense he was put in charge of the shock troops, a guard section known as “the Lions”. Last year Agare led a patrol that found an armed group inside the park. He gave a cry of alarm immediately on seeing the group and thus avoided an ambush. He was the first to leap from the vehicle to cut the retreat of the poachers. His patrol won against all odds, and, in the battle that ensued, even recuperated a girl who had been kidnapped by the LRA in 2009 and managed to return her to her family. As governor of the Province of South Kivu, he annulled all agricultural concessions in the Nindja corridor that connects upland and lowland Kahuzi Biega. These concessions were distributed in an anarchistic manner during the war years. He then sent a mixed mission of park guards and population in the year 2000 to mark the limits of the corridor and assure its integrity. Very early in the morning this mission was attacked and ten persons were killed. Up until today the Minister Kantitima takes care of several of the orphans left by people killed by the invaders. During a transition period Radar assumed the role of interim director for GTZ filling the position with responsibility, good management and taking an inclusive approach. Since he has become the ICCN director of PNKB, he has led the site with a true sense of transparency increasing partner confidence. Unfortunately his sense of professionalism has led to death threats from various factions working against the park. Nearly leaving the post, Radar has resolved to stay working with commitment, visibility and zeal such that PNKB has developed a model community conservation program under his direction, a number of key management documents, an outreach journal and radio shows. Bunda, a native of Monkoto, joined ICCN in 1990 and has distinguished himself as a leader of patrols in the isolated north west corner of Salonga NP. He has made frequent arrests of poachers recovering arms including four AK 47s. Despite strict adherence to his park protection mandate, a job he describes as protecting Noah’s Ark, Bunda has maintained excellent relations with the local population and shown an unusual capacity and interest to master research skillls not only through knowledge of animal sign and local tree names but also through use of basic instruments such as compass. He has led inventory teams for three conservation organizations. Nevertheless, he continues to follow with devotion the duties of a patroller, even after spending several months in jail being wrongfully accused in the killing of a poacher. Ambushed by the LRA on 10 February 2009. Killed by fire at close range when returning from the station of Nagero to the station he managed at Gangala na Bodio. Kidnapped by the LRA during their attack on the Nagero Station, 2 January 2010, after having fought ferociously until all his ammunition was gone. He was tortured such that only parts of his body were found. Shot and killed when fighting to protect the station of Nagero when attacked by the LRA, 2 January 2010. He was “on break” but grabbed firearm and came to defense of station. This chief conservator and these guards were wounded during the counter-attack to save Nagero Station on 2 January 2010.They represent the resistance that ended by finally sending all survivors in the group of ±180 LRA fleeing. Atikpo was known among his fellow guards as “Tourbillon” because of his bravery and rigor. He frequently took part in operations against elephant poachers, operations that have become more and more frequent. In early Sept 2009 he was part of an elite group sent to counter an infiltration by armed poachers. The poachers attacked the guards from behind, they fought back and managed to capture one of the assailants. But they were re-attacked by the same group leading to a fight of two hours during which Atikpo who fought with unquestionable courage was struck by a bullet. He died at the site of the battle and was carried out four days for burial at the Station. Disciplined guard who patrolled with enthusiasm. On the 30 August 2008 his team was ambushed by Mai-Mai . Going to the aid of another guard, he was shot fatally. Fought with determination against the illegal fishing at Kasindi Port. He took apart several illegal fishing networks and sent numerous illegal operators to trial. He was targeted by the poaching networks and at the end of October he was poisoned, dying several days later in October 2008. One of the older guards (born in 1941) who took to heart the massacre of animals in the park. He was particularly zealous in tracking outlaws and poachers in the park. He was caught in an ambush and shot dead, 14 August 2009 when on an investigation of a killed hippopotamus. A very dynamic traditional chief that adopted as his own the principals of community conservation. During the conflict period the guards could not enter his zone, but he patrolled the park with members of the community conservation committee that he led. He turned in two military grade weapons seized from poachers. Committed to the conservation of KBNP. He was twice arrested by military authorities and political administrators because he denounced their destruction of the park through bamboo cutting and forest conversion to charcoal. A population on the periphery of the park was very hostile to the park guards and the attempt to establish a Station at Lulingu risked a murderous uprising. The mwami intervened personally and descended into the villages to directly discuss with the population. His implication, forbidding his people to exploit the park, could easily have cost him his election and thus he is one of the rare politicians that put law and conservation in front of popularity for election. Was killed by armed but unidentified men, when sent to investigate the killing of a gorilla in August 2009. Asuku’s body was found tied to a tree by a passing group of FARDC; he had clearly been subjected to tortures before his death. Asukulu was one of the pioneers, having worked for conservation NGOs in the Itombwe and receiving an initial training in monitoring in 2003. Last group of elephants existing in Katanga on this chief’s land where despite the fact that there has been human/elephant conflict including four of his citizens killed by elephants, he has agreed to the formation of a reserve for elephants in the Buyuba swamp. This area is adjacent to the Upemba National Park. Is of the reigning family but only became chefitaine because of feud between two male members of the family that resulted in the state authorities asking her to take the responsibility. She set out on motorcycle to inform her chefferie of the need for a protected area by conferring with local chiefs and village communities. Twice she arrested poachers during 2009 who killed bonobo to sell as bushmeat. Has actively guided ICCN on traditional steps necessary to lead up to a participatory delimitation of a protected area. These three collaborated to help end poaching of the last population of elephants in the central Congo Forest between Salonga NP and Maiko NP. Guillaume led the initiative to uncover military weapons hidden in the village and surrounding forest. Engesombo brought key information forward and has collaborated closely with Kapere even though he is no longer the village headman. Alatcho is an elder who over the last two years has consistently advised conservation efforts, coming forward with information about poachers even when there was a strong maimai group holding the village. Together these three are still the strongest deterrent to poachers, this is in a village without police or any strength of the law. Kambale participated in the evacuation of settlers from Virunga in 2004. Outstanding assistance during the guard training at Ishango. Killed 29 February 2008, when protecting the population from a “deranged” military who killed first a doctor. As he tried to reason with him, the military fired on him multiple times. After killing Kambale he continued to shoot and kill two civilian women. Kambale is surveyed by his widow and eight children. After the gorilla massacre of June 07, Innocent led an information mission in the sector; he maintained informal contact in the Mikeno sector throughout the period of CNDP rebel control thus permitting a real knowledge of the condition of the gorillas. He has been involved in sensitizing a large community through his Wildlifedirect blog (with Diddy). And he has been fired on in his attempt to stop the charcoal industry inside the park. Remarkably he has maintained an unwavering allegiance to conservation despite ethnic pressure he is from a group involved in the illegal charcoal production. Serges works to stop charcoal production within Virungas NP. Threatened with death, including by Major of FARDC, held in captivity by for several hours by the Interahamwe, attacked with rocks by population involved in charcoal production, still suffers from internal injury to kidney. Paulin started a local conservation NGO, Eco-Action, during the war years. Eco-Action worked with young people, women and Pygmies. After distinguishing himself with IGCP and EU, Paulin was employed by ICCN to take over directly the difficult position of Station Head in the south sector. He was faced with undisciplined staff, heavy poaching, charcoal production within the park, corruption, conflicts between the park and local communities. He gained the respect of his staff, colleagues and partners by the just but firm way he approached all problems. It was his determination in fighting both poaching and charcoal production during 2006 and 2007 that earned him strong enmity, not only outside of ICCN but also from a small corrupt internal core. There have been several attempts on his life, he was openly flogged by FARDC involved in charcoal commerce, his house has been attacked three times. Nkunda also has specifically threatened him and the past-provincial director of ICCN, Mashagiro, falsely accused him of killing gorillas and causing the accidental death of a Japanese tourist. His life has been saved on several occasions by loyal ICCN guards and police. Along with the other guards at the distant outpost of Itebero, François had several confrontations with Mai Mai in 2006. It was during the night of 31 May that the station was attacked by the rebel, Colonel 106. As the sentinelle-guard on duty François fought front-line to save the station. The station was saved, but François received several bullets to his right arm from which he still suffers. Jean was the guard-sentinelle at the patrol post of Mugaba in July 2005 when it received a night raid by a rebel band under “Colonel 106”. Jean was captured and during the next 20 months submitted to torture and forced labor. In August 2006 when he attempted to flee, he was caught and subjected to torture from which he carries permanent scares. In March 2007 he successfully escaped and is once again a guard in PNKB. Native to Salonga landscape (west of park), Venty, as Chef de Village, stood up frequently against outside exploitation of rivers and forests of his village including poachers with AK47s. He forbade his village to trade with poachers. He was the “backbone” of antipoaching campaigns in south-sector Salonga park in 2006-2007. During earlier MIKE surveys, Venty was on the team where a man had an accident and lost his eye. They were four days from the nearest village. Venty kept the team together, carried two packs (the injured man’s as well as his own), and cut the trail to the village. Finally, he swam the river alone to find a fisherman with a dugout. Two independent researchers have said he is the strongest, most dedicated yet simple worker they had ever had on their teams. Iyomi is chief of the largest groupement in the Monkoto territory. Its villagers were forced out of the park when it was formed, nevertheless Iyomi has grown ever more collaborative in the promotion of wise resource use, including a stand against armed poachers. When the conservator of the Mondjoku station fled subsequent to clashes with poachers; the chief took care of the valuable outboard motor and returned it two years later in good condition. He kept it despite threats he received himself from poachers and despite the obvious possibility of using it to improve his very simple level of subsistence. Faced with local extinction of the bonobo in the south west sector of the Lac Tele-Lac Tumba landscape, which is also the far-western extension of bonobo range, Jean-Christophe, who is the son of a traditional chief created a local NGO to revitalize the old customs that forbade the killing or eating of bonobo. The NGO has a cattle farm where some previous poachers work. Alternative work for other poachers consisted of habituating bonobos for viewing. There are now three sites that are operational and where tourists or researchers can travel to view bonobo. Not only does Pierrot coordinate environmental education programs for DRCongo’s urban youth at LolaYaBonobo (a bonobo rescue reserve on the outskirts of Kinshasa) but he also reaches out to government officials with appropriate informative tours. His efforts have grown to include 15,000 youths and other visitors annually. Currently his efforts have spread to important parts of the bonobo range. When informed of orphan infant bonobo at Lodja, he took the opportunity to run local sessions to raise awareness of the bushmeat trade, Great Apes and bonobo in particular. He has developed a very hands-on approach to tackling the problem of bonobo in the bushmeat trade. ABC is also planning the first bonobo reintroduction site. Pierrot has worked closely with local communities to first choose an appropriate site and then to work with them to assure its success. Jean Marie has a dedication and courage that is obvious in his manner of treating wounded and sick guards. Son of the deceased Conservator Mafuko, he is also son of the Park, retaining a sence of urgency and service towards Garamba. Instead of waiting for the wounded in the clinic he is among the first to arrive at the site of the battle. In the last twelve months this has been the case at least three times and each time his devotion managed to keep the worst from happening. There was also a case in 2006 when a women came to the clinic with all the symptoms of hemorrhagic fever, probably Marburg. She died several hours later. Jean Marie immediately took all the precautions to isolate the body and track down and quarantine all people who had had recent contact. His rapid and thorough actions certainly avoided an epidemic that would have killed many among Park personnel. Kongolo (born in 1985) was a disciplined guard of unfaltering courage. He shown an exceptional ability to uncover illegal traffic in protected resources. On the 21st of March 2007 Kongolo had just arrested ten gold diggers and was proceeding to take apart a poachers camp. He was hit by the fire of two guns from the hidden poachers and fell immediately. His colleagues returned heavy fire to neutralize the poachers and then buried Kongolo with military honor there where he fell with his gun in hand. Chief Alimasi firmly supports the RFO in spite of resistance from some of his own elders. He allowed the RFO to use chiefdom buildings for the installation of guards in the western sector of the Reserve and more recently he gave them a large plot of land on which to build the Adusa patrol post. His active support to teams of researchers and guards has not only facilitated their activities in the forest but has made the ICCN a clearly recognized authority within the RFO. The chief’s support continues to be essential in the campaign against illegal mining within the RFO. His persuasive talks, both formal and informal, in the villages have led some of the most resistant miners to peacefully accept the closing of mines. During the 12 years that he has been working in the RFO, Mapilanga has played a major role in the amelioration of the state of conservation of the site. During the years of conflict he organized a first operation, “Tango”, with collaboration from military in order to eliminate poachers and miners from the RFO. After the war numerous military weapons remaining within the population were used for poaching. Mapilanga organized a second campaign in 2006 during which 10 infamous poachers were captured and incarcerated and 20 mining sites were closed. Having created a well-disciplined and trained guard corps, he was able to extend the authority of the RFO over 90% of the protected area’s surface which is a larger proportion than before the war when the Reserve was brand new. In 1990 Mr. Dondo’s first major contribution to local forestry practice was to organize artisanal loggers into an association, le Comité des Exploitants et Négociants de Mambasa (CENEM) that promoted rational forest exploitation as well as the interests of members. He promoted the distribution of legal exploitation permits (at national level) and in 2000 became the Mambasa representative for a Beni based Association of professional foresters. In that role he facilitated negotiations between ENRA (a commercial forestry concession in the territory of Mambasa) and local populations that resulted in a convention that ended illegal exploitation in an important block of the ENRA concession. As a result of this personal implication in regulating forest exploitation during the war, Mr Dondo became a victim of torture and death threats from Ugandan military who felt that he had interfered with their ability to exploit and export Congolese wood. Today CENEM is the only strong and valid voice for artisinal forest exploitation in the Ituri. He admonished the chefs de localités and groupements under his jurisdiction to cooperate with Reserve programs and specifically with inventory and zoning activities. This had excellent results. He offered his own guesthouse to the Community Conservation Agriculturalists during the duration of their work in his area. He greatly increased the effectiveness of the Reserve Guards in his sector by calling joint meetings with the military and local chiefs during which he denounced poaching by the military, and thus weakened their ability to operate with impunity in the region. Finally with the help of local guides, the guards intensified their patrols in the sector and poaching essentially ceased in the immediate region of the Chief’s headquarters. Operating alone, without Reserve guards, chief Apuobo recovered from poachers two AK47s that are currently part of the arms used by guards to control illegal activities. These two brave and disciplined guards met their death in the line of duty in the Maiko National Park early in the recent war. Edezei was previously a military in the national FAZ army who became a park guard. He was killed in the park during an operation to control the activities of rebel Simba soldiers. Safari was killed during a “patrouille de choc” in a violent clash with poachers during which one poacher also was killed. In fact it was only after the guards ran out of munitions that the poachers got the better of them and that Safari was killed. During the three last years while Park activities were restarting bit by bit in the central sector of the park, Mr Ubilo was a central person around whom plans were established and contacts made between political-administrative authorities, park wardens and conservation NGOs. Despite the open hostility of Maimai and other armed groups who spread terror through the region, Mr Ubilo was openly an advocate of the Park and worked to sensitize his population. His support of the park which led him to invite the ICCN to build a patrol post in his native village resulted in his being attacked by criminal groups. His left arm was doublely fractured and his house was burned. Again when he and the warden Kipiri were holding a session of sensitization, they were both physically whipped by these armed thugs. In July 2003 both Mr Mbayama and Mr Amsini were on a mission together to evaluate the state of conservation of the Maiko Park and the possibility of restarting conservation activities. This was during a period of continuing combats and when the park was a refuge for Simba, Maimai, and ex FAR. They were captured by the maimai troops of Michigan (Rombi ethnicity) who were against any activity in the park. They were stripped and marched to where they were to be be-headed. But they were liberated at the last minute by a rival maimai group (Kumu ethnicity). Both Guy and Fidele continue to work actively and bravely for conservation. During the year of 2005, when it was strongly advised not to take the principal road between Goma and Butembo because of pillage and assassinations, Nestor insisted on continuing his work in the region and kept up planned trips including necessary trips even subsequent to known road side robbery. In this way he risked his life more than once crossing what was called the “stomach of the crocodile”. He has also worked recently to sensitize people on the west coast of Lake Edward, a zone occupied with the complicity of traditional chiefs and where ICCN has had a great deal of difficulty working during the turbulent period of the war, particularly during the intense polarization between RCD Goma and RDC-K/ML). In order to work in this area, he initiated regular contacts with chiefs and local people to understand the basis of their problems and work toward resolution. He was the first conservateur to initiate contacts on the West coast after more than 8 years without ICCN presence. Germaine Buhendwa is the founder of the NGO AFECOD. AFECOD has as a central purpose to further conservation at a grass roots level through women, women’s associations and promotion of women’s economic initiatives. AFECOD has chosen to concentrate in the most difficult part of Kahuzi-Biega National Park, the chefferie that includes the corridor where Interahamwe still have camps and commands. It was from the corridor that Interahamwe swept out to attack a group of guards and population a few years back killing 10 people and even now they continue terrorizing villages. Her NGO works to sensitize women, understand their major problems and respond appropriately. Micro-projects have included supplying tools, domestic animal stock, seeds for planting, and communal fields. As she candidly puts it “It is necessary to involve women in conservation so that they will inform and control their husbands”. Two years after he became chief, Kahuzi Biega National Park was extended to include a large part of his groupement. In fact his groupement comprises 40% of lowland KBNP. His support for the park which he called a “maternity” for the animals actually caused some of his people to turn against him. On one occasion he barely escaped an attempt on his life, and that was through intercession of loyal followers. His presence was invaluable to sensitize the majority of the population. He actively aided the census work that counted about 12,000 people living in the Park and he helped in sensitizing all the clans within his groupement that are within the park. He also is working to help determine the limits of the Park and permanently mark them. She has personally participated in guard patrols to chase charcoal burners from the park; her presence greatly facilitated the task. She openly denounced the participation of military stationed near her village in the exploitation of gold and coltan in the park. Her information allowed the park to put pressure on the 10th military region and to mount a “cleaning sweep” to move the military out of the park. Her motivation facilitated the building of a guard post just adjacent to her village and she has temporarily allowed guards to be stationed in her personal house. She actually saved all the material for the construction of this patrol post (steel roofing, cement, planks, etc..) during the battles of june 2004. She works closely with the park for sensitizing the population to respect the park. Over the past five years Mwami Kisali has worked tirelessly to communicate the importance of conservation to his people. He has not been afraid to stand forward even though his position has been weakened with the uncontrolled movements of militias and displaced people through the highland. For instance, authorities within the Mwami’s groupement and under his direction distributed regulations forbidding the hunting of gorillas and buffalo. The Mwami was instrumental in convincing his community and surrounding groupements to support the Kamituga agreement, which paves the way for formation of a legal conservation statute to protect critical parts of the Itombwe Plateau. The extent to which he is respected by the mwamis who are his colleagues is shown in that he was asked to serve as the current interim chief de collectivité d’Itombwe following the dismissal of the previous chief. He upheld the best tenants of journalism, insisting on freedom of the press and investigative journalism, under the most difficult circumstances. He covered openly the issues of illegal exploitation of resources and infringement in the parks of eastern Congo, including agriculture, grazing, mining and poaching. The rebel authorities of Goma kidnapped him and abandoned him in the middle of Virunga National Park at the mercy of nature and rebel factions. After 8 days of arduous march he finally arrived in Kanyabayonga from whence he made his way to Beni where again he started publishing “Coulisses” with the same acerbic insistence on the truth about resource exploitation and the disrespect for the parks shown by authorities. He also covers issues of human rights and political fraud. His honest reporting had him twice imprisoned in Beni for more than a week each time. The journal now has a printing of 2,500 to 3,000 copies twice a month. After discovering an important population of bonobos in an area where he had a hunting and farming camp, Mange agreed to give up all his activities in the area and declared an area of about 30 km2 to be forbidden for hunting. His brother being chief of the village, Mange proved to be an indispensable negotiator for all subsequent researchers. Since the beginning of the war he has several times been the target of arbitrary arrest and harassment as it was considered likely that the whites has left him with money. He was shot next to his head, had an arm broken and several times had his home and goods pillaged. His wife also was beaten by military. Even after such treatment, Mange returned to work for conservation. Always a valiant fighter who never retreated from attacking poachers, it was he himself who arrested the two delinquent poachers on the patrol where he was killed. After three days of march, and at the command of his chief, Ngongo untied and released the captured poachers. One of them, Mr. Ngobila, instantly wrenched the weapon from the head of the guard team and turned it on Mr. Ngongo firing 10 times with the automatic weapon. Mr. Ngongo is survived by a widow and five children.